Well the answer is yes! You can make a basic cheese, often referred to as cottage cheese, from milk powder, water, vinegar and lemon juice. In an economic collapse or SHTF incident, cheese would become a vital protein source, if you had the ability to make your own. Also, it means that together with your stored pasta and tinned tomatoes, you could also make lasagna! This same cheese can also be made from fresh milk, just substitute the milk powder/water for the same quantity of fresh milk. Almost everyone loves coffee. In fact most of us NEED that morning cup of coffee to get us up and out the door… From a preparedness and homesteading point of view, I see two problems with coffee. Firstly it is getting more and more expensive to buy, and secondly, if there every is a total collapse or a SHTF incident, we are all going to miss our coffee badly – whatever coffee which may still be available will likely be poor quality and astronomically expensive. If you live in the right climate, or you have a large greenhouse, you can actually grow your own coffee plants at home. Coffee plants are actually pretty easy to grow, their main pet-hate is frost. It’s processing the coffee beans which takes a bit more work, but even then, I think the rewards make it well worthwhile! Get planting now, as it can take between 2-4 years before the coffee plants start to develop any usable quantities of cherries. We make and eat a lot of jam – there are only so many strawberries you can eat before you start thinking about canning them to enjoy over a longer period. One of our favorite ways to make jam is to make: Quick & Easy Freezer Jam, but we will definitely be trying this sugar and pectin free, strawberry and honey jam, as it is simple to make and sounds delicious! Pretty much everyone loves lemonade. The problem is that store brought lemonade doesn’t actually contain that much lemon (if any!). Instead it is full of artificial flavors/colors, and corn syrup or artificial sweeteners, depending on whether you choose the sugar free version. The recipe below from ‘A Flock In The City’ contains all natural ingredients, including 12 lemons! This homemade lemonade is also full of healthy probiotics. Have a go at making this delicious, healthy probiotic lemonade. Lemonade has never been so healthy! Another dairy post! I don’t know what is wrong with me at the moment… Oh yeah, that’s right, I LOVE dairy! Check out some of our other recent posts: Make Mozzarella From Milk In Just 30 Minutes and How To Make Butter From Milk (Couldn’t Be Easier!). Today we are making ricotta, and if anything, it is actually easier to make than homemade mozzarella. You need just four ingredients to make ricotta – whole milk, cream, salt, lemon juice. Depending on how firm you like your ricotta, it can be ready to eat in 1-2 hours. If you like it soft and spreadable, it’s an hour, if you like it firmer, leave it longer. We get through loads of apple vinegar, but we have an apple tree so we can pretty much make our own apple vinegar for free! Apple vinegar is delicious, we use most of it to make salad dressing, but it also has numerous health, beauty and around the home uses. Apple vinegar really is worth making, especially given how simple and cheap it is to make! Apples will soon be in season, if you have your own apple trees, you’ll have more apples that you know what to do with. Even if you don’t grow your own, apples become very cheap to purchase from the store. You can even make apple vinegar with apple peel and apple cores, in fact that is what is used in the DIY tutorial below. We have found the best results come from using the entire apple though, but feel free to use what you have available. Check out the DIY tutorial below and see for yourself just how easy apple vinegar is to make! Of all the ants in the US, none is feared or loathed as much as the red imported fire ant. 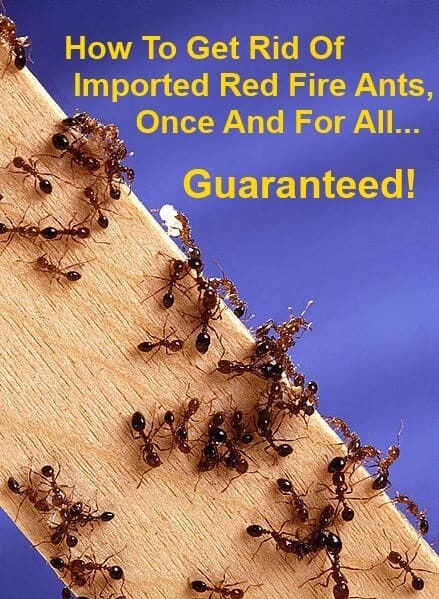 Fire ants can ruin a garden in no time at all, they are aggressive, they have a painful sting (especially if you are stung multiple times), but the serious problems start when they begin entering your home…. There are lots of supposed ways to kill/get rid or imported red fire ants, but most are ineffective or simply don’t work. If you want the methods that truly work, give these a go, you won’t be disappointed. Many folks believe that pouring boiling water over a fire ant colony with do the trick. This might work for a small colony, but the problem is that as the boiling water passes down through the soil, the temperature drops dramatically. What usually happens is the ants at the top get killed, but the ones at the bottom survive, and the colony will bounce back in no time. The most effective way to get rid of fire ants is to make the following mixture and then drench the colony. Mix 1 1⁄2 ounces of orange essential oil, 3 ounces of liquid dish soap and 1 gallon of water. This will kill all ants that come into contact with it, and unlike boiling water, this method will continue to work over several hours/days. This method works because orange essential oil (actually all citrus oils) contain an extract, d-limonene and this extract kills imported red fire ants. To make this method even more effective you can try adding a few handfuls of molasses, as this will entice any ants to the mix, that were initially missed by the drenching. Orange oil can be expensive, so another way to make this mixture is to use orange peels. You can actually also throw in some lemon and lime peels as well, but I would say go for at least 50% orange peel. To make the fire ant killing mixture, simply fill up half a 1 gallon container with the citrus peels and then top up to 1 gallon with water and leave for 4-7 days. Then just strain the mixture to remove the peels, add the liquid dish soap as above, and you’re ready to go. This method does require a lot of citrus peels, you’ll need to save them up, or you could ask a local restaurant or better yet, a juice bar, to give you their waste peels. Another effective way to get rid of fire ants is to dig up the colony and remove or destroy it. To do this – dig out the colony, making sure you dig down below it to be sure to get them all. The usual method is to have several buckets ready to put the colony into so it can be removed/destroyed. Be sure to coat your shovel with corn starch or baby powder to stop the ants from climbing up. Also, you might want to tuck your pants into your socks! The most important thing to do is to not give them a reason to enter your home in the first place. Don’t keep your garbage by the back door, and be sure to keep your floors and surfaces clean. Other than this, the most effective way of keeping imported red fire ants out is to use diatomaceous earth. Actually diatomaceous earth will also kill and prevent Spiders… Other Ants…Fleas…Cockroaches…Bedbugs…Earwigs…Silverfish…Millipedes…Centipedes… Diatomaceous earth kills all of these insects when it come into contact with their bodies. It effectively binds to them and dehydrates them. Most will die within 24 hours, although cockroaches can take a few days. When buying diatomaceous earth or DE, you want to make sure you buy ‘food grade’ diatomaceous earth as other grades can contain additives which can be harmful. Food grade diatomaceous earth is harmless to humans and mammals, so it is safe to use around children and pets. To use diatomaceous earth, simply sprinkle it in the areas the ants are entering and gathering in the home: doorways, windows, air ducts and behind cupboards and furniture. Keep this topped up and your home should be ant free in 24 hours or so. If not, you are not putting the diatomaceous earth in the right locations. I should add that diatomaceous earth loses its effectiveness when it gets damp/wet, therefore it is not very effective when used in locations which are either damp or wet. You might be surprised to hear but with the right method, milk, butter and cheese can all be preserved in wax and it can keep (un-refrigerated!) for up to 5 years. For most people dairy makes up an important part of a well balanced diet, so it stands to reason that, if possible, it should also be part of your emergency food storage supplies. A while back I did the post: Make Mozzarella From Milk In Just 30 Minutes which was extremely popular! Given that so many of you liked the idea of making cheese out of milk, I am assuming that you will also like to know how to make totally delicious butter! This one I’ve got, as making butter from milk is easy! It’s even easier to make butter from cream, but I have said how to make butter from milk, so let’s stick with that for now. First things first – pour one gallon of fresh full-cream milk into a container with which has a mouth wide enough for you to be able to skim the cream from the top of the milk when it forms. Now put your container of milk into the refrigerator for 12 hours or so, overnight will do. Next carefully skim off the cream that has formed on the top of the milk. Once you get down through the main cream and it starts to get thinner and more milk like, stop! Add the cream to a large jar, making sure not to fill it more than 40% full. Put the lid on tightly and shake vigorously for between 10-30 minutes, depending on how vigorous you are! Once you start to notice a distinct separation, with the beginning of the butter clumping together within the butter milk, slow the shaking right down, but keep going; within a minute or two your butter should start to turn yellow. Now strain the butter from the buttermilk through a colander (save the buttermilk for pancakes!) and rinse under the tap. Shake off as much water as possible and add the butter solids to a bowl and mix them together to form one large mass, if there is still excess water in the bowl, pour this out. Now it’s simply up to you to add some salt to your butter (to your taste), mix it all together, put the butter to a container with a lid, refrigerate and enjoy! There you go – you’ve turned milk into butter! As said, it is much quicker if you are already starting off with cream, but now you can pretty much make butter from either cream or milk. I love cheese. So personally, I couldn’t be have been happier when I stumbled across this tutorial on how to turn a gallon of milk into delicious fresh mozzarella in just 30 minutes. Not only is this a very cheap way to make mozzarella, it is also very useful information for preppers and homesteaders. The ability to make your own cheese can bring much needed variety to your food, and homemade cheese could also be used for bartering or selling. To make your own mozzarella, you need Milk, Citric Acid powder, Liquid Rennet or 1/2 tablet Rennet and salt. Check out how it’s done below.